Manisha, your write up is very touching..I am really sorry for your loss..
Manisha, I don't know what to say to that post. I am with all tears now. I am very sorry for your loss. My parents mean the world to me and I can't even imagine a life without them :(. I can undrstand the pain (When my grandmom passed away).Your mom will be blessing you from up you and your family ,manisha. Your mom is there with you in memories. My, yes, this draws tears ... I lost my Mom in a much similar way, my Dad and I did hospice for her for over a year. It was a blessed time, in many ways, for her and for our family. But life goes on, yes? Thanks for visiting Kitchen Parade, I laughed out loud on at the heavenly pun and had to explain why to a friend on the phone, luckily another foodie and one who's both eaten and made Holy Slaw! several times! The garlic / ginger jars I find are from China but the only preservative is citric acid. So it might be worth while to keep an eye out, even if it doesn't take so much time. I know what you mean about the standard supermarket fare, though. Thats a very tochy post manisha. Dont worry manish though mom is not with you all her blessings will always be with you..
Manisha,I cant find words to console you!I too have lost some of my close relatives due to cancer. Words are so inadequate at times. Just wanted to say though I am very sorry for your loss. That blue diary is so mom. It must mean the world to you. That was so wonderful to read. Oh, Manisha..all our hearts goes to you and if words could speak, we are feeling your loss after reading your post. Take care buddy, your mom is with you guiding you in every aspect of your life! It's very hard to lose a parent. It's inevitable but we tend to lead our lives on the premise that nothing will change. Thank you all for your kind words, I appreciate it deeply. AK, I begged for the world to stop when we lost our father. But when we found ourselves doing his chores the night after his death, we knew that whether we wanted to or not, life would go on. The sun rose the next morning; his beard did not grow. I took a break from my career to look after my mother. We were very lucky to have the wonderful aura of my nephew, then 2 years old, around us. His antics helped ease the pain, physical and emotional. Ashwini, that blue diary is very precious. 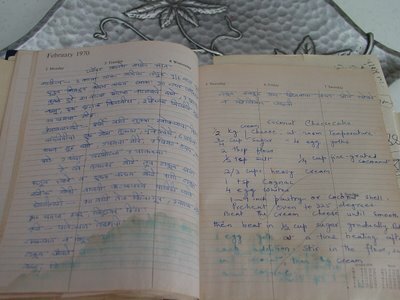 It's an old Life Insurance of India diary that has everything from recipes to knitting patterns to Marathi-Swahili translations. Since I was always with her, I don't have letters that I could read and re-read. This is the closest I have to handwritten letters. KrishnaArjuna, Shilpa, Vineela, Sudha, Sumitha, Gini and Kitchenmate, thank you again. I am all in tears now, manisha! Thinking of your mom, thinking of my mom, and thinking of all the moms....I am so sorry for your loss. Thanks for reminding us to tell our moms how special they are, and how much they mean to us. Even though I talk to my mom several times in a week, I forget to tell her how much she means to me in my heart. Makes me realise even more how we need to hold on and cherish the ones near and dear to us..we never know what future has in store for us. Before you wrote this,your mom wwas in your heart,mind,body and soul. Now that you shared, she is in my heart too. She is so beautiful,like a princess,like a movie star. I am sure she was princess in her heart too, to bring up a daughter like you who would write about her like this with so much love. I just wanted to give you a hug, can't write anything. I lost my father three years ago,i miss him everyday, i know how it hurts. It is my first time on your blog. I am touched and moved by your writeup. Your mom was beautiful. That is a lovely picture you have of her. I will pray that you find peace in your heart. I agree with Mythili ~~ your mother's generous, loving spirit is within you, and passed on to your daughter. That does not erase the pain, but holds some small comfort. I am sorry for your loss. Berautiful post, I feel the pain because I was not able to share my family with my mother,she died of heart problems, she was a devoted mom and sacrificed a lot for us but did not live to enjoy it.It has been a long time but I still feel sad, every day I remember her and wish I could cook something for her.They say time heals, I think it does but vey slowly.be strong because even though she is not physically here, her spirit lives on. I would just like to give my mom a nice big hug, like the ones she gave me. Very sorry for your loss. I feel a lump in my throat just dont know what to say. So touching. She is probably an angle watching over you. Manisha, thanks so much for tagging me for this meme. I enjoyed thinking about it more than I had imagined; and reading your post really made me sniff. Like Mythili said above, though, you are to Medha what your mum was to you: that way she lives on. It was a beautiful tribute you wrote to her and I'm sure she's smiling. Time for a big group hug! indianadoc, I lost my father very suddenly too. In much the same way. I was not yet 18 at the time and felt very cheated by life. Our lives changed drastically as we were in Kenya at the time and we had to move back to India. We were very lucky to have close friends and family help us through the process of relocating as well as all the government procedures that go with such a move. The sense of loss was immense. We lost our father, our friends, our home. RP, in our culture we don't put into words how we feel. It's something that is understood, for the most part, isn't it? I got to spend a lot of time with my mother and she knew how important she was to me. We were very close; so close that she could start speaking mid-sentence without any reference to context and I would know what she was talking about. Someone once told me that we were close and best friends only because of the circumstances - she was dependent on me. Initially that hurt but after a while I realized that it didn't matter why. What mattered was that we shared a deep bond. Mythili and Linda, you touched a chord there. I do think of Medha as a very special gift. Most of the time I feel she deserves much better than me. Mythili, I told you this would be difficult for me to do but I am glad I did it because it has helped me a great deal. Thank you for tagging me! Shilpi, you are so right. Life changes in a snap. We are still reeling under the shock of losing my father-in-law very suddenly earlier this year. L G, when you wrote movie star, it brought back another memory. My father used to tease her that she was Leela Chitnis, who was very popular when they were growing up. They grew up in Belgaum, not far from Dharwar, Karnataka, from where Leela Chitnis hailed. This picture of my mother dates back to the early 1960s when she was pregnant with her second child, a brother we lost when he was about 6 months old. Your tribute to your mother was simply super. I re-read your post many times and I keep smiling when I think of her. For some reason, the title music from Malgudi Days plays in my mind when I read your post. Thank you for sharing your mother with us. Archana, it's very hard and my heart goes out to you. My parents are not physically in this world but they are with me all the time. There are times when I feel their presence around me and that helps a great deal. A big hug to you, too! Latha, it's good to have you here. Thank you very much for your warm thoughts. starry nights, I know what you mean. I long for those hugs filled with unconditional love. I get the same kind of hugs from Medha, my daughter. And I give in to the warmth that engulfs me and feel very blessed. I read your blog and realized that we have a lot in common. Have you been tagged for this meme? I am going to update my post to tag you. Maybe you can write a beautiful tribute to your mother, like the one you wrote for your father on Father's Day. I am trying to remember the last time my mother cooked. The last that she did make anything was probably her own tea. I would work late into the nights and she wouldn't want to disturb me. The most she did was was a tarka or help with cleaning of veggies from her bed in the last two years of her life. I didn't cook till then. She was my guide, giving me instructions on what to do next. It never tasted right to me but she never complained. These are recipes that aren't written down anywhere. I long for them and my ready-reference is her sister, my aunt. Unfortunately, this time difference of 11 and half hours and the crazy schedule we keep makes it difficult for me to catch her at a reasonable time. Shankari, I feel your friend's pain. It took me a long time to forget the trauma of the last few months. It gets a lot easier when you focus on the good memories rather than the pain they endured. Krithika, I think both my parents are watching over me. When my daughter was very young and did not know or understand death, I used to tell her that her grandparents live in a big temple in the sky. She wanted to get on an airplane so that she could go up to the clouds to meet them. A big thank you to Garam Masala for starting this meme. desiknitter, I thought of you a lot last night. We made a simple dinner: bhendichi bhaji with moong dal and rice. Medha made the rice and the note in her summer journal is just too cute. I'm so glad you had fun with this meme. I am off to read it now! Iam so sorry for you loss. Nice picture of your mom. She is beautiful ! 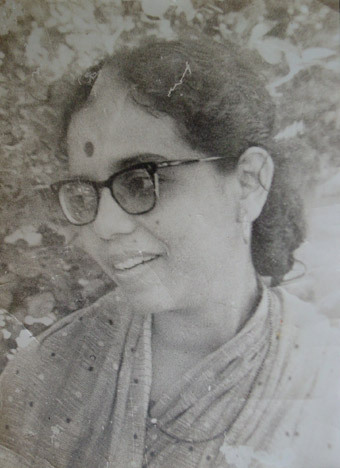 Resembles so very much like my mom, she has a mole on her upper lip, she was wearing a same kind of glasses , she used to keep a bindi just like that, now it has come close to the place were the eyebrows meet. I had to tell all this coz my mom looks so much like ur mom. wat is Ravathy- Ravath , my marathi is very poor. Manisha..thank you for those kind words, I was young and thought my mother would last forever. I am glad I have Maya,she is away at school, but we talk often. I did write a tribute for my mother on mothers day.you can read it in the archives in may. Mythili, I wish I could tell you that you can prepare for this. You can't. What you can do is enjoy what you have at the moment. Like Starry Nights says, we expect to go on forever. As for ravath-ravath, it's just a silly thing we did as kids. The letter Kh, in Devanagari, is written as Ra and Va joined together by the bottom stem of the Ra. Separate them and you have RaVa instead of Kha. Therefore ravath-ravath. Khath-khatha is a kind of vegetable stew using tirphal and is a very popular dish in our family. Ashwini has a recipe for khath-khatha on her blog. Starry Nights, I realized you had already participated in the meme. I missed your post the first time I visited your blog. I was very touched by your Father's Day tribute. I edited my post to that effect. I hope that I can have the kind of relationship with Medha, that you share with Maya. Let's talk about something funny now. Like ravath-ravath. I too used to do this as a child. So, 'Kharwas' would become 'Rawrawas' and Khandoo, the servant at my Mamas' place, would become Rawandoo. My Mamas used to love it, when I did it. (Btw, I always made sure that Rawandoo never got to hear this. Poor guy.) I am looking forward to all the charades that my daughter will come up with, when she is older. Vaishali, that is hilarious! It's nice to know that there are/were other crazy kids like us! Poor Khandoo! The name Khandoo takes me back to the really earthy Marathi names! He may even have laughed with you, you never know! Sometimes I feel bad that our kids will miss out on stuff like this, but you know what? They will come up with their own antics. I look forward to you sharing funny and endearing stories with us as your daughter grows up! Nabeela, welcome to IFR and thank you for your warm thoughts. What a lovely, touching, heartfelt write-up, Manisha. I lost my dad 18 years ago but I still miss him - I wish he could have been there for the milestones of my life... he died at 46 of a tropical virus that destroyed his liver. (Oddly enough, we too lived in Tanzania and Kenya until we had to move back because of his failing health.) The only consolation, and it's a pretty poor one, is that he has left behind wonderful memories by which to remember him. Just like your mom. Shammi, I am so sorry that you lost your father so early. I know how you feel. I used to feel that life dealt me a poor set of cards; but I look around me today and I cherish what I have. As I know you do. What a coincidence that you were in East Africa, too! Maybe our paths have crossed before? We never got a chance to visit Tanzania as the border was closed just before we moved there and it took a lot of red tape and bureaucracy to cross over. So we just gazed at Mt. Kilimanjaro from the national parks that were close to the border. I have wonderful memories of Nairobi! because of my blogging break for almost two months, i didnt get a chance to read this post until now, and now Iam all in tears. Sumi, I am so happy for you and your mother. Remember, this holds not just for our mothers but everyone we care about. I too am very touched by your narrative and sorry for your loss. Daya, welcome! I wish I could help you but you've hit a dead-end with me. Vaishali mentioned Khandoo; he was part of their household. I think that was his first name, not his last name. Why don't you check with her (click on her name and it will lead you to her blog) and perhaps she could help you? Best of luck with your search! This brought tears to my eyes too...I do have both my parents and I remind myself everyday how lucky I am. For the last few years I have made an effort to look above petty things and truly cherish them while they are around. There are few friends who haven't experienced a loss of a parent which makes their presence even more precious. We lost my MIL two years ago to cancer. All of us were thankful she didn't suffer for long - 3 months from diagnosis. She would have loved my blog. She was a great cook and there are notebooks filled with hand written recipes she planned to try. Manisha, your write-up brought tears to my eyes too. What a wonderful tribute you've written to your mom. It made me think of my relationship with my parents and also with my MIL and FIL, who I'm very close to. They are special people but I don't think I tell them that often. Your post has given me lot to think about. Hugs to you. Your post on your mother is so touching and brought tears to eyes. I know this post is a year old, but the pain of lost love is always fresh. Life just moves on, still when we take a moment to think on the lost we feel the pain all over again. I hope with time one gets to forget the pain and think only of the happy time spent with them. I clicked on your link in somebody's roll list because your blog name is catchy. I am glad I did. Anita, I try to stay in touch with my aunts and next week, I'm heading out to meet one of my maushis. She was most like my mother, in looks as well as temperament. I don't look for my mother in her but there's that familiarity that is very comforting. I am looking forward to this visit! Shilpa, I'm happy that this post touched a chord. Hold on to what you have; it's precious! Srivalli, welcome to IFR! I am glad you clicked through and found my blog. I am pretty much with wonderful memories now but I have my moments. It gets easier on most fronts; on some others, it's still tough. I hope to see you around mere! Manisha, good to know your thoughts. Finally I have been able to kick start. 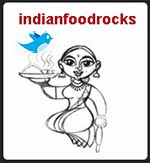 Do check www.cooking4allseasons.blogspot.com and let me know your comments!. I have linked you in my page. Hope its ok with you!. Came to your blog through Cooking for all seasons where she mentioned about your post "My mother" and was curious to read it. Tears rolled down my eyes while reading it through. Very touching I must say. I have lost my uncle, and my cousin brother to cancer and I know how it feels. And I could not see both as they were in India and I am here in US. If she is not with you physically, she is in your memories. I read this tribute to your mother. Your pain has spilt all over the page. It made me very sad.I do have my parents in India, and am here in the US. I speak to amma everyday. If for some reason I cannot speak to her a day, I go nuts.. I just cannot imagine life without her. 10 years away from home and mom, I have begun to realise that my mom lives in me, the things I do everyday. I am to my kids, what my mom is to me, in many ways. I pray you discover the same in your life. I would like to add your site link on my site. Can I ? I have a blog www.myfoodarama.com that I just started recently.